Piglet’s 2nd birthday crept up on us this year. Just 2 months after Christmas, I was a little stumped by what he could possibly want for a present. With friends and family asking what they should buy him I realised it was time to start thinking outside of the box! It can be hard enough to know what to buy for your own child, never mind for someone else’s. 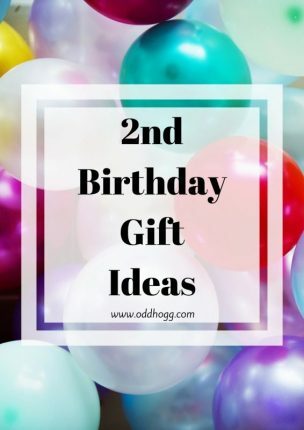 I have shared what Piglet was given this year, in the hope that it might help you come up with some ideas for what to get the 2 year old in your life! Piglet has been a little slow to pick up most “active” things. He was slow to crawl and walk, and is hilariously bad at climbing when we go to KinderGym. So although I don’t have much hope for his abilities when it comes to using a scooter straight away, I figure he’ll never learn if we don’t give him a chance! We have got him a little scooter for his 2nd birthday, along with a Cars helmet to keep him safe. I hope that by going out with his cousins he might pick up what to do and be raring to go by the time the weather is warmer. Tad’s Fridge Phonics is a game from Leap Frog that introduces children to the letters in the alphabet and the sounds that they make. There are different settings to suit varying ages of children, meaning it’s a toy that will grow with them. Piglet is starting to count, and now I am looking forward to getting him started with letters and increasing his vocabulary in that way too. Piglet definitely looks up to his cousins, and since their current fad is PJ Masks that means his is too! The new Let’s Go PJ Masks DVD was released earlier this month and I know it’s going to be a big hit. There are 6 episodes on the DVD where you see the trio solving mysteries and learning lessons as they go. Perfect for those moments where Piglet needs a bit of screen time so Mama can get things done! Piglet has started scribbling, but at only just 2 he can’t be trusted with crayons alone as goodness knows what he would draw on! JHogg and I bought him a magnetic drawing board in our recent Toys R Us haul, but what we didn’t know at the time is that my parents had picked up a Paw Patrol drawing board for Piglet already. Mess free and portable, it’s going to be a great toy to take with us on trips too. Ideal for plane rides and long car journeys. Piglet has had his Toddlebike2 for quite a while now, but it is really only since Christmas that he has started using it. Marketed as a pre-balance bike, it allows toddlers to explore the idea of a bike without having to actually balance yet. It has been a huge hit in recent weeks, with the poor dog being tormented as Piglet races around the kitchen on it. Of course, this is just a selection of options and there are so many great things out there for toddlers. What did you buy yours for their 2nd birthday?